Description: This contemporary Metro Fusion V shaped shade is an original design which is far from the traditional. 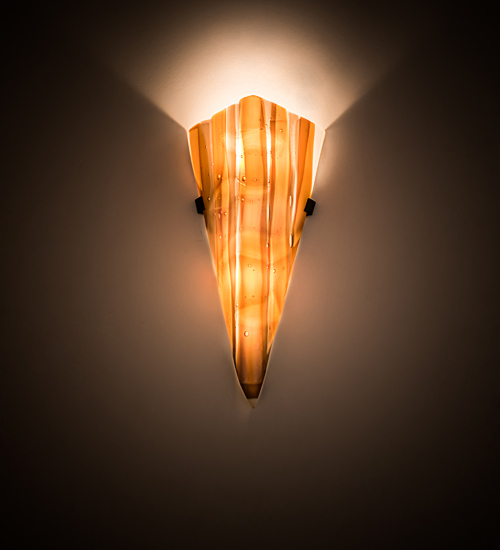 This unique shade is handmade in our Marina pattern of Iridescent Amber, Beige, and White colored, kiln fired, fused art glass, paired with wall fixture hardware. Designed and created by our artists and craftsmen in Yorkville, NY, this sconce will vary slightly due to the nature of glass forming. Custom options include a broad range of sizes, colors and designs, as well as dimmable energy efficient lamping options such as LED. The 7.5-inch wall luminaire is UL and cUL listed for dry and damp locations.